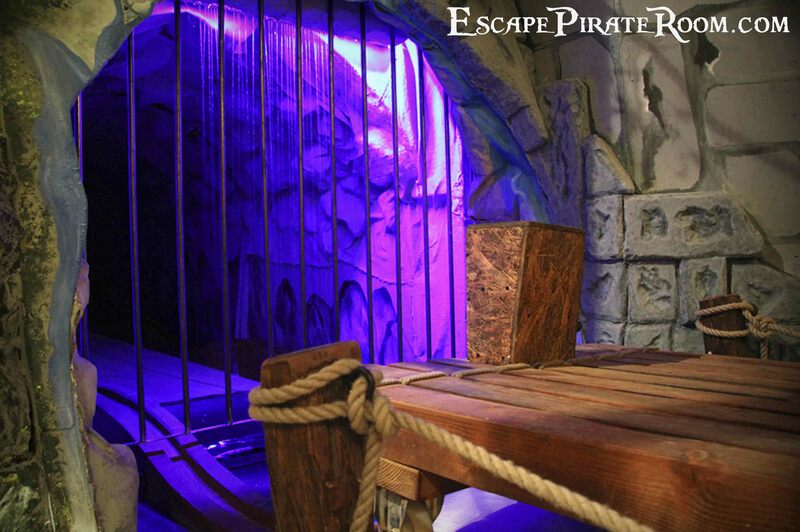 If you ask any enthusiast about escape rooms to play in Budapest, they’ll almost certainly mention the Pirate Cave. It’s 50% more expensive than any other room, it’s well outside the centre and it’s a standalone room with no others at the same facility, so the fact that it still got strong recommendations made me feel it must be particularly special. There’s a huge gate outside the industrial complex where it’s located which harks back to the peak of the Soviet era and, to be honest, left me a bit intimidated. We were coming at the weekend, so the main gate was shut and, while the guard didn’t speak any English, he understood “Kalozbarlang” even in my terrible Hungarian accent and pointed us in the right direction with the help of a handy map. I’m guessing we’re not the first group of foreigners to walk through early on a Sunday morning looking a bit lost. They’d opted for a video introduction, which has its good and bad points – consistency is always a good thing, and you can make sure that it’s top quality, but I always feel a bit disappointed when I don’t get the full experience from the host. That said, our GM handled it nicely, giving us the introduction to the game before retreating during the video and returning to show us to the room. I have to say that I didn’t catch the whole story, but it more or less went like this: you have to escape from your cell, travel to the pirate cave and find a way out with the treasure. From the moment we entered the game, I was enchanted. The room looked pretty, and the first puzzle we had to solve was both tricky and relied on teamwork. The lighting was set at a level that gave the impression of a cave but without being so dark as to make the game painful. As we explored the space further, we would find plenty of trinkets and features that reinforced the setting, as well as several puzzles that helped to extend the story. My favourite part of the game was probably about halfway and, thinking back, this is one of the most impressive pieces of theatre that I’ve had in an escape room. I wish I could describe it to you in detail, but there are too many spoilers. Needless to say, it fitted perfectly with the theme and helped to tell part of the story in a very physical way. Indeed, it’s worth pointing out that it’s a genuinely strenuous part to the game, and the unlucky team member who got that task looked genuinely tired by the end of it. All games have their weaker puzzles, and this was no exception. One in particular left us incredibly frustrated. Readers of the blog will know that I’m not a big fan of colour’based puzzles, especially if the colours aren’t very distinctive. Unfortunately, they’d gone to town here with colours that were really very, very similar. The uncertainty over the colours, combined with one part of the puzzle being a bit vague anyway, led to us feeling entirely lost. We knew what we had to do, we’d found all the clues we needed and yet we still spent another ten minutes trying to get the answer – that’s turning a fun “a-ha” puzzle into a tedious experience. It’s worth mentioning something that we missed out on but which becomes apparent reasonably early in the game: the clue system here is very different from other locations. I’m a mug for things that stay within the story, and the clue system is probably the hardest part of the game for that. From what I saw, it didn’t just keep to the story: it actually extended it and, while that might technically break Room Escape Artist’s Rules about setting the players back on the path to success, I think the game was the richer for it. Finally, you can tell a lot about a game by how the host handles things going wrong. At one point, one of the props broke (not our fault, honest!) and, after we’d made a few loud comments to each other, a replacement magically reappeared in a way that was consistent with the game. Perhaps this particular prop lent itself to that, but I’ve seen plenty of other places handle that situation a lot less well. This game manages to put in a decent level of challenge without ever making things truly difficult. While there are undoubtedly some weak moments, those are more than offset by the strengths – a fantastic piece of theatre in the middle and a magnificent clue system. This is one of those games where I think a larger number of players enhances the experience. Not because it makes the room easier but because it’s an experience more than just a game. If you’re the sort of team that wants as much time solving puzzles as possible, then go along with three or even two people. On the other hand, if you can share nicely, then I think you’ll have a lot of fun taking three or four people with you on the journey into the Pirate Cave. Our team of three escaped in 45 minutes without taking a clue.